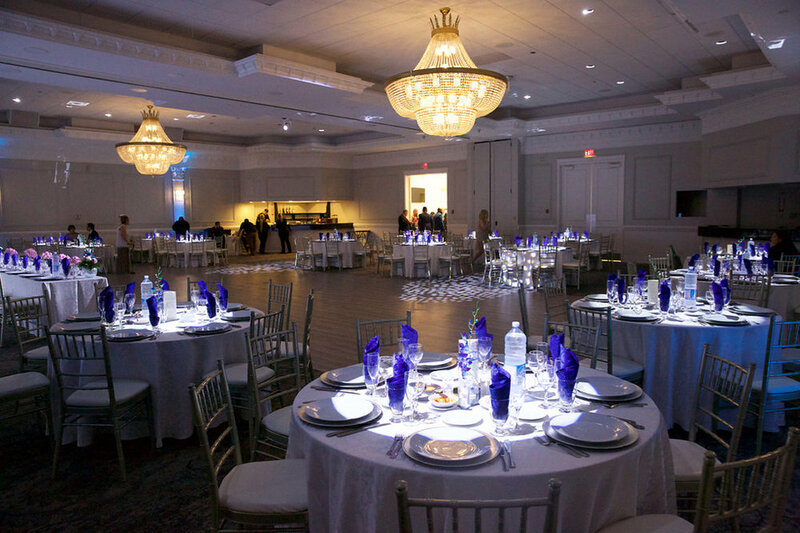 Conveniently located minutes away from HWY 407/ HWY 400 in Vaughan, Ontario, The Avani Event Centre is the ideal setting for Weddings, Celebrations, Conventions, and Seminars. The spacious and elegant premises feature over 30,000 sq.ft. of space, complimentary parking for 400, and can host events up to 800 people. Two private entrances welcome you and your guests into elegant lobbies with a fireplace feature and a baby grand piano. White marble floors, pillared ballrooms, soaring 20' high coffered ceilings, grand skylights for natural light, imported chandeliers and private bridal rooms provide an opulent setting for your dream wedding or celebration. The Opus Ballroom can comfortably accommodate groups from 175 to 850 guests. It features a private entrance and lobby enhanced with a baby grand piano, luxurious fireplace and three grand skylights allowing an abundance of natural light. The lobby is completed with private washrooms and bridal rooms. The 10 000 sq.ft room features 20’ coiffured ceilings, detailed crown moldings and elegant pillars showcased around the perimeter of the room. The Vista Ballroom can comfortably accommodate groups from 50 to 250 guests. It features a private entrance and lobby enhanced with a grand skylight allowing an abundance of natural light, as well as private washrooms and bridal room. The 4350 sq.ft room features 18’ coiffured ceilings, detailed crown mouldings and elegant pillars showcased around the perimeter of the room. WHEN CAN I MAKE AN APPOINTMENT TO VIEW THE VENUE? Fridays through Sundays from 10:00 AM to 3:00 PM. Please call or email to schedule an appointment for a tour of the facility and to go over menu selections and pricing. No, our special events team can assist you with all your planning requirements. Here at AVANI event centre, we are pleased to custom design your menu. AVANI event centre does allow outside caterers to provide catering services for clients that want specific ethnic catering or who have specific religious requirements that cannot be met by our catering team. A food waiver would be required to be signed by the convenor and the catering company, waiving AVANI event centre of all liabilities. Absolutely! Tastings are complimentary once you have contracted with AVANI event centre. CAN WE MAKE CHANGES TO THE MENU? Yes, we can always customize a menu to fit your event. Additional fees may apply based on the changes you make to your menu. CAN WE PROVIDE OUR OWN BAR? All our bars would close by 1:00 am unless specified otherwise. For an additional fee, you can extend you bar until 2:00 AM. WHAT TIME DO EVENTS NEED TO END? All events have scheduled end times but the latest an event needs to end would be 2:00AM. WILL OTHER EVENTS OCCUR ON THE SAME NIGHT? Yes, we have multiple rooms at AVANI event centre, so other events may take place at the same time. CAN YOU BRING IN YOUR OWN DJ? AVANI event centre offers 400 complimentary parking for all guests. Yes, as long as they are contained in a candle holder or votive holder. We accept cheques, cash or credit card.